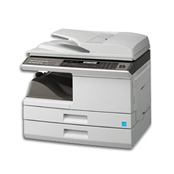 The Sharp AR-208S and AR-208D Multifunction Document Systems are big on performance but compact in size. Designed for small offices and workgroups, the AR-208S and AR-208D deliver all the required features for fast-paced, small office environments. With 20 page-per-minute copying/printing and integrated color PC scanning, your office workflow won't miss a beat. A 50-sheet document feeder provides standard 2-sided scanning for extra efficiency, as well as duplex printing and copying (AR-208D models). The cost-effective, consumable system utilizes a three-component system that's easy to replace and easy on your wallet. And since business never stands still, the AR-208S and AR-208D offer flexible options to add Super G3 faxing, networking and web-based management...so you'll be ready for anything. Electronic sorting and offset output stacking allows copying of multiple sets quickly and efficiently. Flexible paper handling includes a 250-sheet paper supply, upgradeable to 500 sheets. 50-sheet multi-purpose bypass tray handles different size paper ranging from 3 1/2" x 5 1/2" up to 8 1/2" x 14" as well as envelopes, labels, and transparencies. Scan and send documents to a variety of destinations for easy distribution. Increase productivity by converting black & white and color documents into digital files that can be shared, archived, or e-mailed. Button Manager, a built-in utility that automatically scans your files to Sharpdesk, E-mail, Fax, OCR, Microsoft® Word or other designated application. Sharp's convenient ImageSend technology allows you to share documents with Send to FTP, Send to E-mail, Send to Desktop and Send to Print (requires optional network expansion kit). Robust paper handling abilities include a 50-sheet Reversing Single Pass Feeder, standard 250-sheet paper supply and an optional 250-sheet paper cassette, 200 sheet output tray capacity. Super G3 Fax Kit expands functionality to include fax capabilities.